Read-out Instrumentation Signpost: Power relationship celebrated! Anglia and Renesas are celebrated 10 years of a successful relationship at a special dinner, with Anglia distributing the Renesas’ range of semiconductors, power and analogue solutions in Britain and Ireland. Anglia first distributed Intersil (who were recently acquired by Renesas) in 2008, offering a range of innovative power management and precision analogue solutions successfully for a decade. 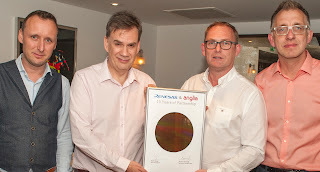 To mark the occasion, the team from Anglia and Renesas met for a special dinner in London. Anglia supports Renesas product ranges including the innovative Renesas SynergyTM Platform, microcontrollers, mixed signal ICs and System on Chip devices on Anglia Live, for same day shipment from stock. Anglia have trained members of its Field Application Engineering team to support Renesas devices and technologies. The Intersil range of innovative power management and precision analogue solutions is already well supported by the Anglia team and on the Anglia Live site.